Best for: Travellers from across Europe connecting onto long-haul routes. The crowd: Mainly Dutch travellers and Brazilian passengers, older generation on a long-haul leisure route. Business or pleasure: Most passengers were relaxed and in couples. Rio is much more leisure oriented compared with the sister Sao Paulo route. That said, the new seats are on the Rio route, not the Sao Paulo route, so for those looking for extra comfort should pick the Rio route for now. Routes: KLM have an extensive network around the world, aided by their collaboration with sister airline Air France. One of the best networks for long haul around with a great base at Schiphol airport. Frequent Flyer Programme: Flying Blue, which is used by both Air France and KLM, good reward availability and earning options. 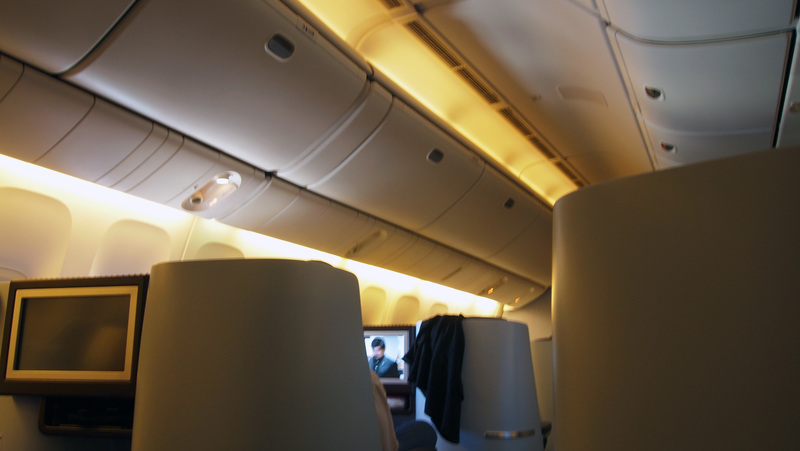 Best bits: New seats by far are the game changer, along with extensive IFE and excellent food options. Worst bits: Not much… The seat has a small footwell when converted into a bed which can be a little restrictive for taller people and there is no WiFi available yet. KLM have had their new World Business Class (WBC) seats for a while now. 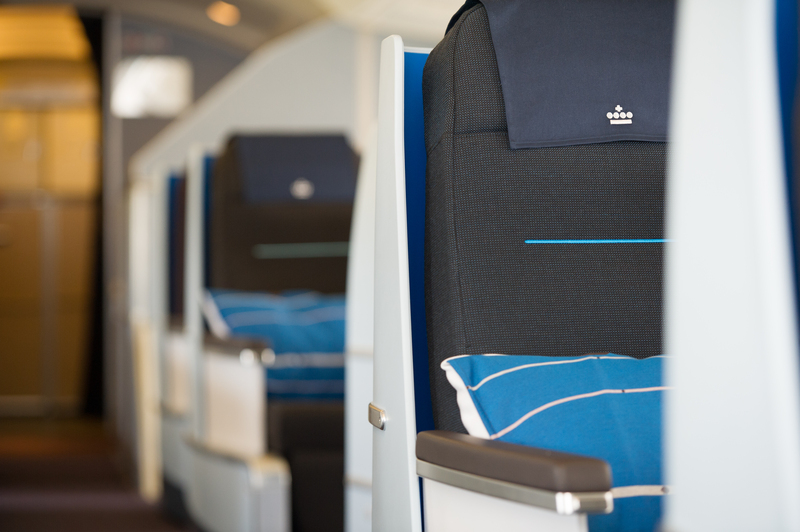 Designed by Helle Jongerius, the new seats have been progressively rolled out over the past two years and more and more passengers are getting to experience them, which are a marked improvement on KLMs older cradle style seats. A trip to South America allowed TheDesignAir to experience the new product on the 777, which offers 34 business class seats as well as KLM’s crown lounge in Amsterdam. 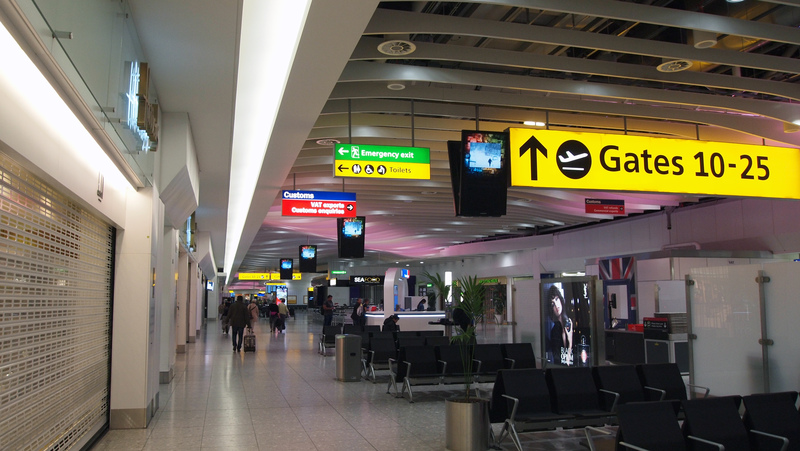 Starting our trip in London Heathrow, we headed to the usual terminal for SkyTeam departures, Terminal 4. 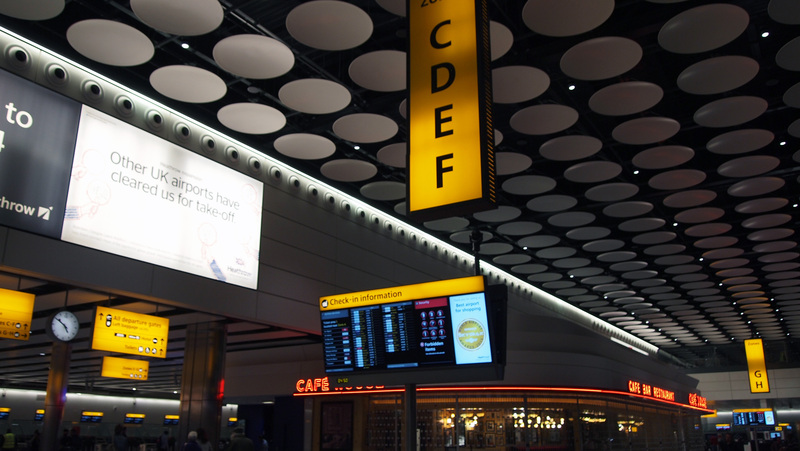 With a very early departure and one of the first out of Heathrow, we arrived in the dark and made our way to the check-in desks. KLM has check in desks in Zone G&H, which are shared with Air France. As Air France and KLM both have a few early morning departures each, the check in lines were large, but moved quickly. Those travelling in business class however, have access to two desks, with their own dedicated staff catering to SkyTeam’s ‘Sky Priority’ passengers (which includes frequent fliers as well as those travelling in premium cabins). There was no queue when we checked in. Being greeted by friendly staff, our bags were processed quickly and we were given our onward boarding pass too, which as a first for us, was a combined boarding card, with both legs listed on the one card with one barcode for both flights. We like this, makes it easier to travel. Now that passes are just scanned at airports, rather than manually being counted, makes a lot of sense to us – and more environmentally friendly. We hope to see other carriers do this too. Those travelling in KLM business class have access to the fast track lane, which at 5.45am, was empty, allowing us to get airside within approximately 10 minutes from arriving at the airport. The Skyteam lounge is situated opposite Gate 10, and above the Etihad lounge. This early in the morning, the lounge isn’t fully operational, such as offering Clarins massage and facial facilities, however, they still offer a full hot English breakfast buffet, along with drinks options, situated on the top floor of the two floor lounge. 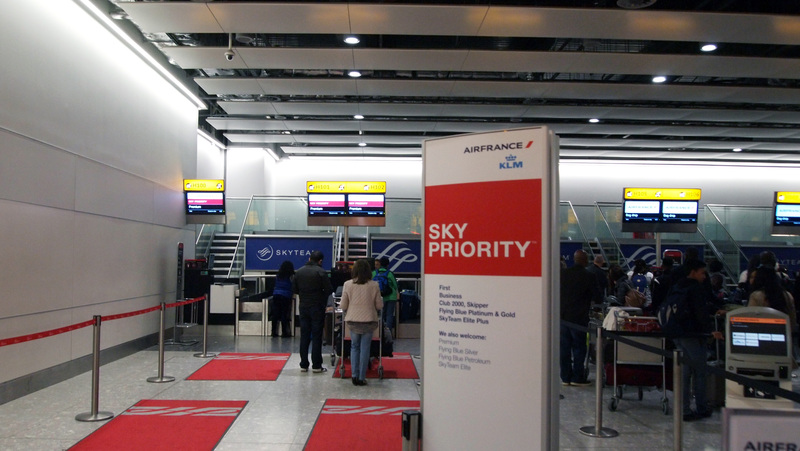 The lounge is the same lounge used by Skyteam carriers in Terminal 4, including Alitalia and Air France. Check out our recent Alitalia trip report for an extensive look at the Skyteam lounge. 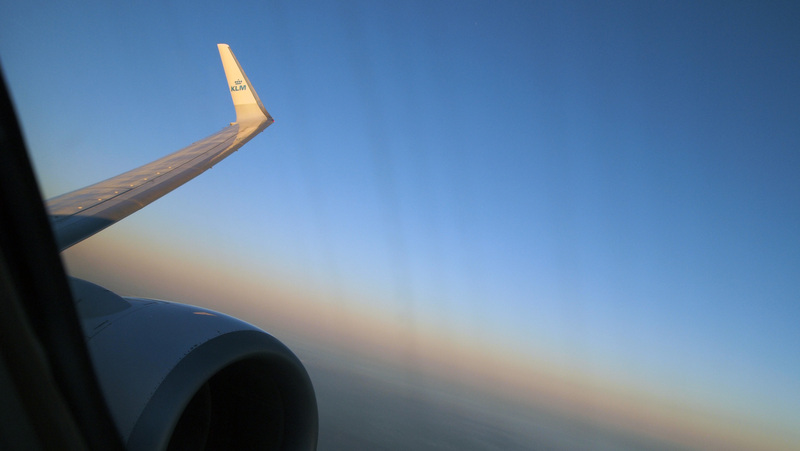 The connecting flight, between London Heathrow and Amsterdam is operated by a mix of aircraft, our aircraft for the flight, a 737-700 was roughly 70% full. The business class cabin however, was less than 50% full. Like most European carriers, KLM offers a ‘business light’ concept, whereby the same seats are used as the economy section with the middle seat being blocked off to offer extra space and comfort to flyers. Even though it was a very short flight (approximately 45 minutes) the cabin crew managed to serve the cabin with speed, without feeling rushed. The cabin crew were incredibly friendly, greeting every passenger with a genuine and unique conversation, taking genuine interest in the passengers. Whilst no IFE is offered on these flights, we recommend bringing your own personal device to keep yourself entertained. Food is excellent and our breakfast was both continental and fresh. 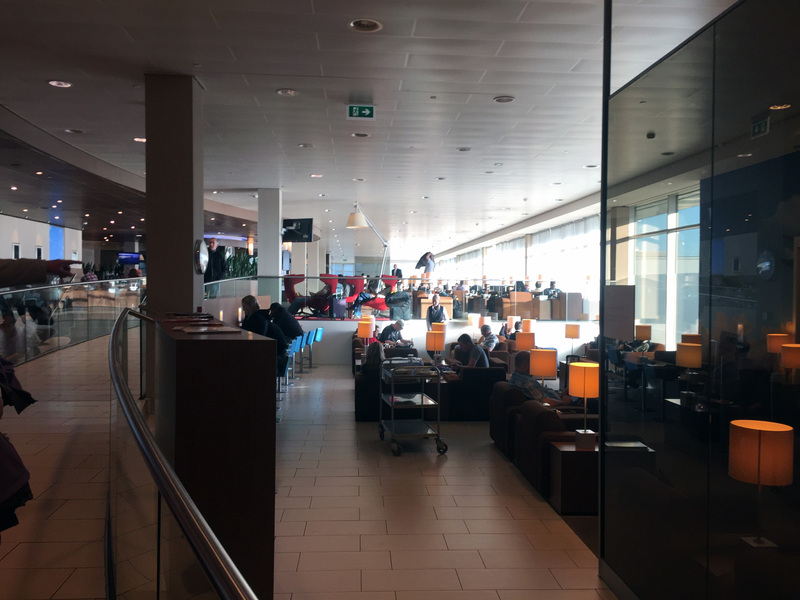 On landing, we arrived at the D gates, being a non-schengen flight, whereby it was a quick walk to the larger of the two Crown Business Class Lounges in Amsterdam Schiphol, whereby we had just over an hour to spend before boarding the flight to Rio. KLM have a very large and spacious lounge in Schiphol airport, which was fairly busy when we arrived. There are two main wings on entering, one lower wing which is mainly seating. The second, and the larger of the two is situated on two levels, both featuring a buffet bar and self-service drinks station which both offer an extensive range of food and drink. The upper level is probably the most light, with large picture windows looking out onto the apron. The seating is comfortable and carefully arranged to make the space feel less expansive, and allow single travellers and passengers travelling together to sit in comfort. The lounge also features a fairly powerful WiFi, that could support a FaceTime conversation without any issues. There are also work stations, a dedicated dining area, and also a smoking area inside the lounge. By the reception are a bank of staffed desks, allowing passengers to speak to KLM agents about any questions they may have. There are no boarding announcements, so after seeing the flight was boarding we headed to the gate. KLM’s World Business Class cabin on the 777-200 and 777-300 is identical, with 34 business class seats run across 6 rows in a 2 x 2 x 2 configuration. The first five rows are in the forward section of the cabin, and row 6 sits behind the main entrance door to the aircraft, creating a separate one-row intimate cabin, which was filled with families on our flight. The row is also situated just ahead of economy, so may be less appealing to passengers. KLM’s 777s don’t have the attractive mood lighting that other aircraft have, however, the general impression of the cabin is pretty impressive. Bulkheads feature the KLM logo in metalwork, however, Jongerius’ design touches go beyond just the seat. 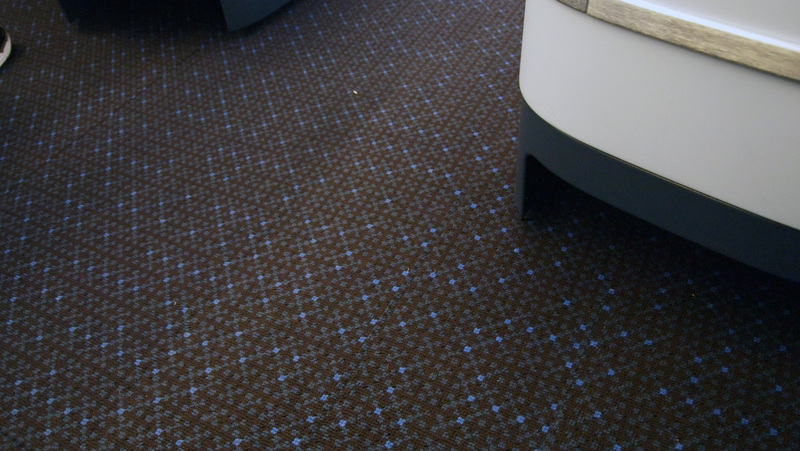 The carpet, which runs from one side of the aircraft to the other without interruption is ingenious (and a world first), the small flecks of blue coming from recycled cabin crew uniforms. The curtains feature a circular motif, matching the dot matrix elements found in both the carpet, and seat dividers. As we covered a while ago on the site, the new B/E Aerospace Diamond seats are a great product for KLM. Whilst they don’t offer all aisle-access, they offer a great amount of comfort, and being slightly angled and staggered, offer enough privacy for a solo traveller, whilst not being too separated for those travelling together. We chose one of the centre seats, which mean that you won’t have someone stepping over you during the flight. These middle seats are ideal for solo travellers, and the best seat is D which is angled and stepped behind the companion seat, whilst also angled away from the seat on the other side of the aisle. The seat is fairly wide, and has a manually lowered arm rest, which can offer increased seat width for larger passengers, whilst also providing extra privacy or increased space whilst in the bed format. The seat turns into a fully flat bed, which with the addition of a fairly narrow footwell, offers 78″ of bed length. Our only gripe with the seat is that the foot well was fairly narrow, which meant turning over during sleep could catch our feet. That said, sleeping foetal meant no issues at all, and the sturdy nature, and flatness of the seat meant sleeping was no issue. The seat offers plenty of storage, with a shoe storage situated under the seat in front, a tray situated under the TV screen in front of you, and a storage area by the shoulder, which allows for personal items, whilst also offering USB and International power sockets for charging personal devices. Situated next to the seat is a slim document pocket, which allows the storage of passports, magazines and menus. The seat’s table, which extends from the central unit between the seats is both sturdy and easy to open and stow. The one element we loved was the dot matrix privacy screen. It is static meaning it can’t be moved, however the finish contrary to our original concerns (of it being kept clean), was faultless, and whilst seemingly random was an almost-lavish design element to help create a unique product for KLM. KLM offers a fairly excellent food and drink offering. 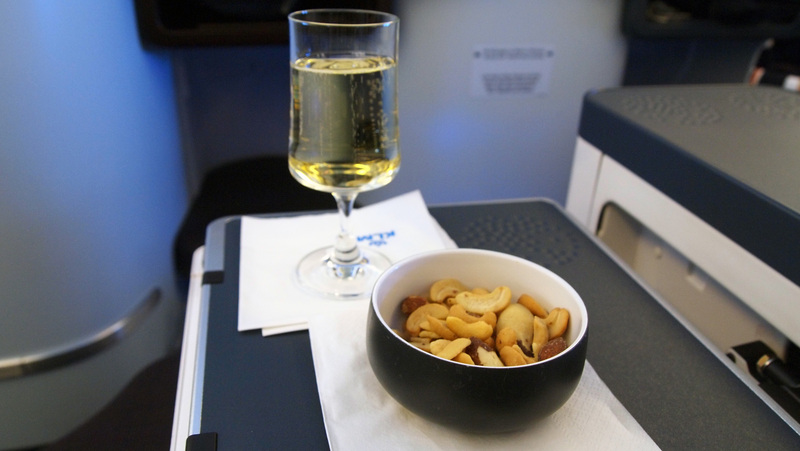 On boarding we were offered a glass of Nicolas Feuillatte, Brut Réserve Champagne, and like all of KLM’s inflight service, we were treated to Dutch designer Marcel Wanders glassware and tableware which added a touch of Dutch class to the experience. After take off we were offered hot towels. We were swiftly handed out menus and our orders taken, while food was prepared, we were offered a second drink along with warm nuts. 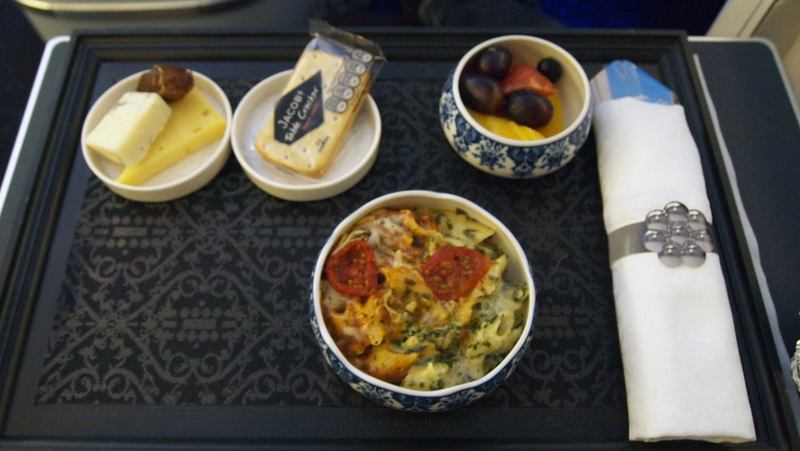 KLM offer two meals during the flight, the first being the main meal, and the second meal just before landing a hot smaller dish. The menus were very extensive, offering excellent wine pairings. We opted for the South African Sauvignon Blanc to accompany the meal which was an excellent option. We started off with a Quinoa salad with dried beef, which was delightful, and the presentation excellent, definitely restaurant quality. The side, of an extra salad (?) was equally as tasty, and with the addition of croutons and smoked beetroot dressing was equally as amazing. 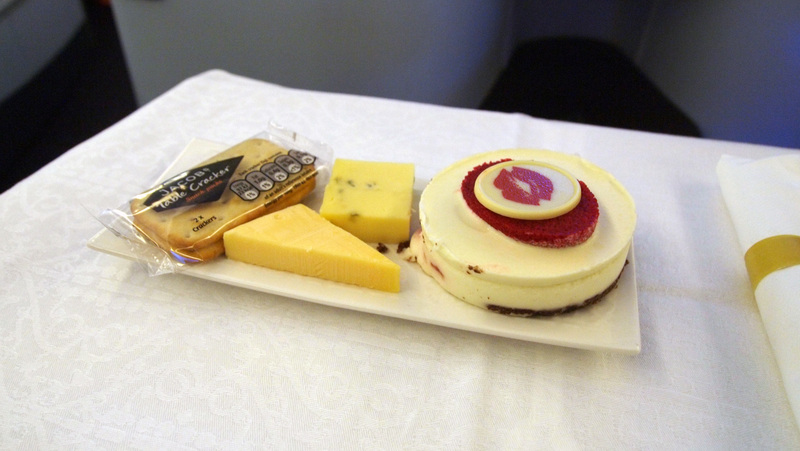 This in itself would be enough of a meal on most carriers, however, KLM also offered a main course. 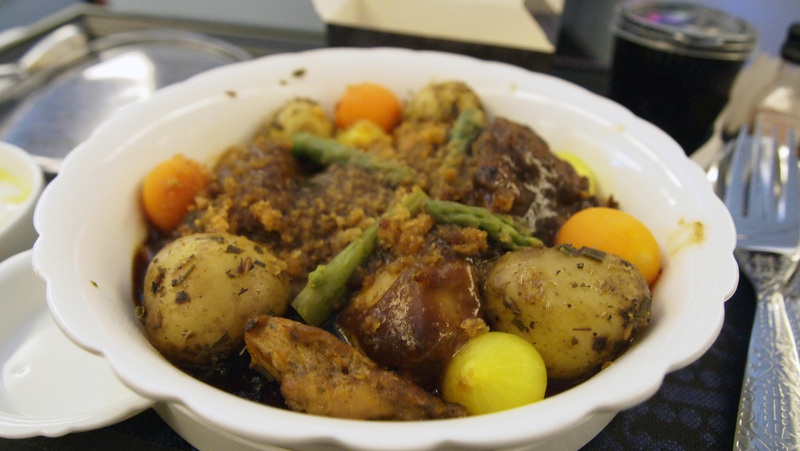 The main course, which we opted for, was a chicken in Horseradish sauce, with assorted vegetables and gingerbread crumble. It was beautiful, rich and filling. The overall dish was more than amazing, although having seen the sea perch that also was popular, we feel we would have been happy with all of the dishes that KLM serve. To follow, there was the opportunity to dine on a coconut raspberry mousse, served with whipped cream, although we were so full, we opted out of the whipped cream. The mouse was fantastically light, and the little chocolate kiss on top was a fun touch. Admittedly, we wouldn’t have served cheese and mousse on the same plate. During the flight we opted for a couple of Australian brand ice-creams, which were perfect to nibble on during the extensive movie selection. Approximately 2 hours before landing tables were once again dressed and a lighter hot meal was prepared. The Penne pasta with cheese and tomato compote was rich and tasty, and accompanied by a small fruit salad, and naturally being a Dutch carrier, more cheese and crackers. Other options included a turkey club sandwich and a chicken Waldorf salad. 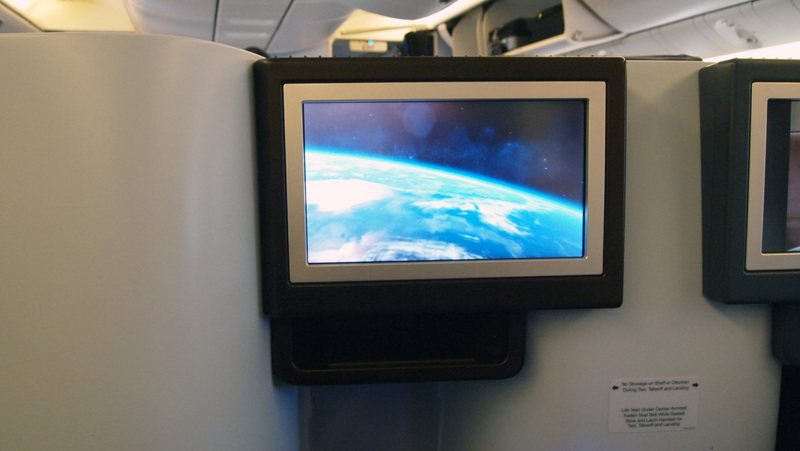 Each seat offers a 17″ touchscreen TV, which uses Panasonic’s ex3 system, which is one of the best now in the skies. KLM have invested in a very extensive film and TV library, along with a moving map system which is incredibly powerful. While the screens are quite far ahead of each passenger, there is no need to perform a yoga move to pick a movie thanks to the second large handheld screen situated in the seat. This not only allows passengers to have the moving map and flight information active on the handheld control whilst still watching the movie interrupted, but allow passengers to create a playlist of entertainment whilst enjoying the main screen. One gripe is the position of the controller, which is vertical, meaning that it’s not easy to read or view when stored in its cradle. There also a large selection of newspapers and magazines available, as well as Holland Herald, one of the oldest inflight publications in the world. Did you know it used to be a newspaper? 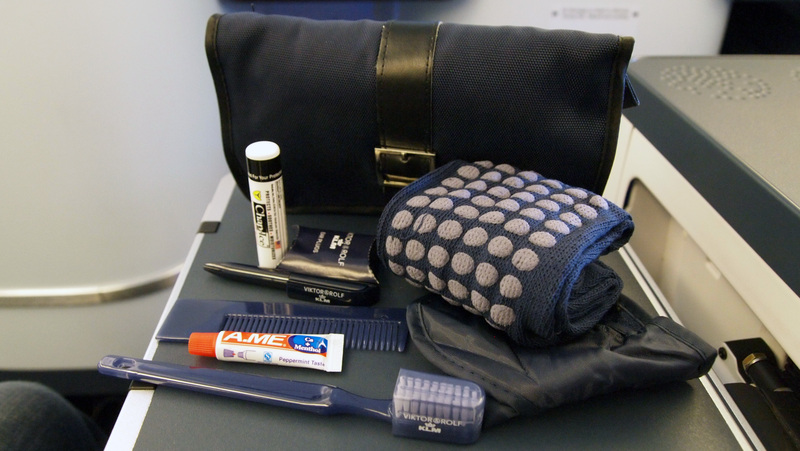 Celebrating all things Dutch, KLM have partnered with Viktor&Rolf to provide them with a fairly basic, but beautiful amenity kit. Both men’s and women’s kits seem to differ, but the mens one features all the usual amenities, including some very nifty non-stick socks. The bag by far is the best element of the kit, and a real keepsake. There is no WiFi currently onboard, meaning passengers can really switch off. KLM offer plenty of personal touches such as hot towels and small chocolates after a meal. What is also lovely is KLM also offer every passenger a KLM delft house as a small token of appreciation to take home, which is gifted at the end of the flight just before landing. There are 95 houses to collect, one for each year KLM has existed, and they even have a site for you to keep track of all of the houses, as each one is unique, and has a special story behind it. We were incredibly impressed by KLM’s new World Business Class, the seat may not be a world leader in its class, especially considering each seat doesn’t have aisle access, however, the improvement on what the carrier originally had was lightyears ahead, getting rid of the awkward middle seat found on its larger wide-bodies. The service was fantastic and food and drink exceptional. The service elements such as Marcel Wanders tableware and Helle Jongerius designed cabin make for a really fantastic passenger experience, and KLM, like sister carrier Air France have put their best foot forward in the past couple of years, meaning KLM is a very valid business class choice when looking at long haul flights. Considering KLM’s price points are notoriously cheaper than competitors, its well worth a try. Almost all aircraft should feature the new seats by late 2016. The 787 which KLM has just accepted and are brining into service, will have a very similar fully-flat seat product, although, offering all-aisle access. Well done KLM, we really do like your solid long-haul business class product. THEDESIGNAIR.NET TRAVELLED AS GUESTS OF KLM, HOWEVER THE VIEWS EXPRESSED HERE ARE OUR OWN. 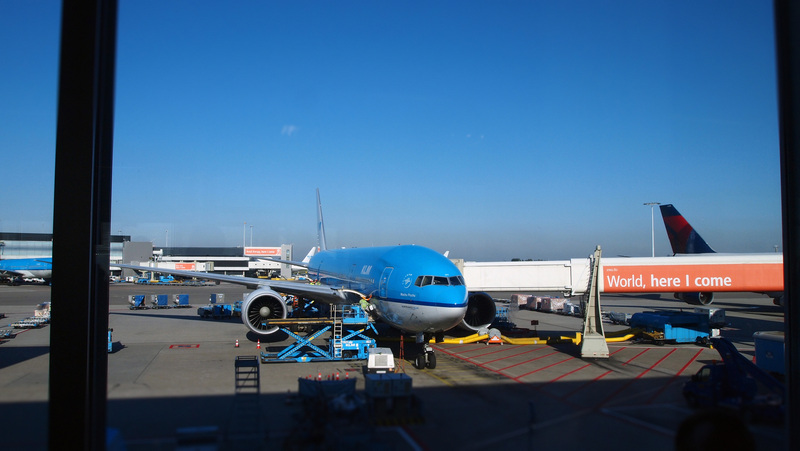 Just flew on KLM from Vancouver to South Africa via Amsterdam on World Business and thoroughly enjoyed the experience. I totally agree with your comments. One negative was Schiphol…like the airport and the amazing plane spotting (and fantastic viewing deck) but hated how busy the airport was inside. 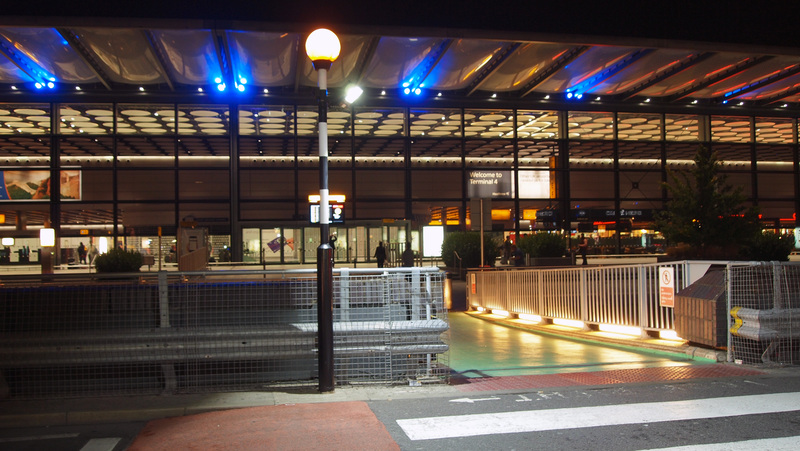 Time for a brand new airport, Amsterdam. Schiphol is a victim of its own success. 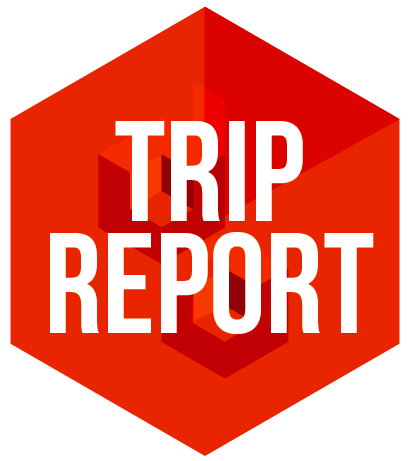 Nice report. Looks like a decent business class product. Btw nice photos too. Why do you use?